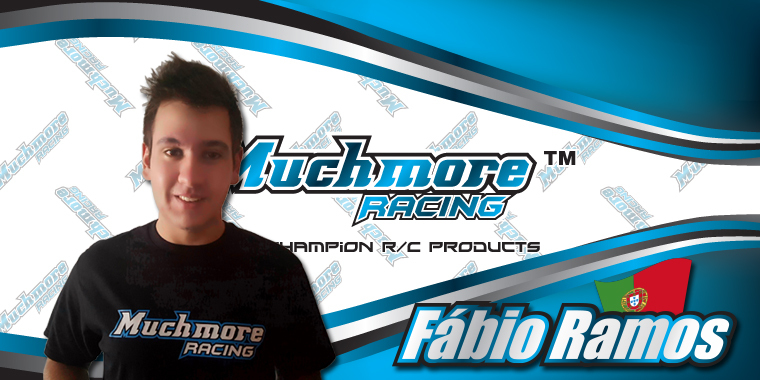 www > News > Fábio Ramos joins Muchmore Racing. Fábio Ramos joins Muchmore Racing. 2013 - 3rd Place on Portuguese National Championship junior class 1/8TT Off-Road. 2014 - 1st Place on Night Masters 1/10 off road championship (winning all the races). 2015 - Portuguese Cup Warm-Up TQ and 1st in 4wd and 3rd in 2wd. 2015- Portuguese Cup TQ and 2nd in 4wd and 2nd in 2wd. "After test the muchmore electronics, my choice was clear! Products with top quality! Since child when I started on RC cars, I saw drivers winning the major races around the world with their products, and today after more than 10 years I am part of the team! I am very proud and thankful for this opportunity! Thank you to sir Ji-Hyun Jang and sir Yusuke Kobayashi!"